Our brain requires a lot of energy to work properly. Sugars are usually the main type of fuel for the body, but when they run low – for example during a food shortage – fat, in the form of fatty acids, can be used instead. However, the brain cannot directly process these molecules; instead, fatty acids need to go through ketogenesis, a process that turns fat into ketone bodies, which the organ can then burn. Scientists believe that the ability to create ketone bodies was essential for us to evolve large brains. Yet, it is still unclear if all mammals can transform fatty acids into ketone bodies. One way to look into this question is to track whether other species have HMGCS2, the main enzyme that drives ketogenesis. Jebb and Hiller examined the genomes of 70 different species of mammals for the gene that codes for HMGCS2. The comparisons revealed that cetaceans (whales, dolphins and porpoises), Old World fruit bats and the African savanna elephant have all independently lost their working version of HMGCS2. Yet, many members of these three groups have evolved brains that are large for their body size. The genetic analyses showed that dolphins and elephants developed big brains after the enzyme became inactive, challenging the idea that HMGCS2 – and by extension ketogenesis – is always required for the evolution of large brains. These results may also be useful for conservation efforts. Many fruit bats across the world are severely threatened, and their lack of ketogenesis could explain why these animals are highly sensitive to starvation and quickly die when food becomes scarce. Periods of fasting are a common event for many animals (Secor and Carey, 2016). Fasting occurs due to natural food scarcity or as part of the life history strategy, for example during hibernation or migration. During fasting, the organism relies on stored sources of energy such as glucose in the form of glycogen and fatty acids (Secor and Carey, 2016). In addition, ketone bodies become an alternative fuel source that is important for many mammals to survive episodes of fasting or starvation (Baird et al., 1972; Bouchat et al., 1981; Sicart et al., 1978). For example, ketone bodies are used as an energy source in hibernating ground squirrels or elephant seal pups during their post-weaning fasting period (Krilowicz, 1985; Castellini and Costa, 1990). Notably, while the brain cannot metabolize fatty acids, ketone bodies can cross the blood-brain barrier and provide fuel under conditions of low blood glucose levels. For example, after starving for 3 days, the human brain takes 25% of its energy from ketone bodies and if fasting continues, ketone bodies replace glucose as the predominant fuel for brain metabolism (Owen et al., 1967; Hasselbalch et al., 1994). During the neonatal period, the developing human brain has high energy requirements and also relies on ketone bodies as a major fuel (Cunnane and Crawford, 2003; Cahill, 2006). Given their importance in fueling large, energetically expensive brains, it has been posited that ketone bodies do not only have an important role during fasting, but have also been crucial for brain expansion during human evolution (Cunnane and Crawford, 2003; Wang et al., 2014). Ketone bodies comprise acetoacetate, acetone, and d-β-hydroxybutyrate (Figure 1A) and are mainly produced in the liver by ketogenesis. This metabolic process occurs in the mitochondria and uses fatty acid-derived acetyl-CoA to generate the water-soluble, acidic ketone bodies, which are secreted into the blood. The rate limiting step of ketogenesis is the production of 3-hydroxy-3-methylglutaryl-CoA (HMG-CoA) by HMG-CoA synthase (Hegardt, 1999). Mammals possess two HMG-CoA synthases that originated by gene duplication. While the cytosolic enzyme, encoded by HMGCS1, is broadly expressed and is necessary to produce cholesterol (Hegardt, 1999), the mitochondrial HMG-CoA synthase, encoded by HMGCS2, is primarily expressed in the liver and is only used for ketone body production. HMGCS2 is required for ketogenesis, as mutations in the human gene and mouse gene-knockdown experiments abolish or greatly reduce ketogenesis (Bouchard et al., 2001; Ramos et al., 2013; Thompson et al., 1997; Wolf et al., 2003; Pitt et al., 2015; Cotter et al., 2014). HMG-CoA synthase-2 deficiency in human can lead to coma after fasting for more than 22 hours due to low glucose levels (Thompson et al., 1997; Morris et al., 1998). Human individuals with HMGCS2 mutations therefore require regular carbohydrate intake but show no other symptoms, suggesting that this deficiency is probably underdiagnosed. Evolution of ketogenesis in placental mammals. (A) Biosynthesis of ketone bodies (blue font). With the exception of the mitochondrial HMG-CoA synthase (HMGCS2, red font), the other two enzymes required for acetoacetate production also have roles in amino acid metabolism and are thus pleiotropic. BDH1 is only required for converting acetoacetate into d-β-hydroxybutyrate. (B) Recurrent loss of HMGCS2 in three independent lineages (red font). All species in black font have an intact HMGCS2 reading frame. Boxes are coding exons proportional to their size, introns are shown as horizontal lines. Red boxes are exon deletions. In-frame stop codon, frameshifting insertion/deletion and splice site-disrupting mutations are indicated. With the exception of the heterozygous 1 bp deletion in the black flying fox that has a read support of ~50:50 for the derived and ancestral allele and reveals two distinct haplotypes (inset), all shown mutations are supported by at least 30 reads with no support for the ancestral allele (Supplementary file 1). Insets exemplify the validation of inactivating mutations by showing the local genomic context and four reads. Here we investigated the evolution of HMGCS2 in mammals. Unexpectedly, we identified three independent losses of this gene in cetaceans (dolphins and whales), pteropodids (Old World fruit-eating bats) and Elephantimorpha (elephants and mastodons). Remarkably, these species have relatively large brains, suggesting that, unlike in humans, ketone bodies are not strictly required for fueling complex brains. 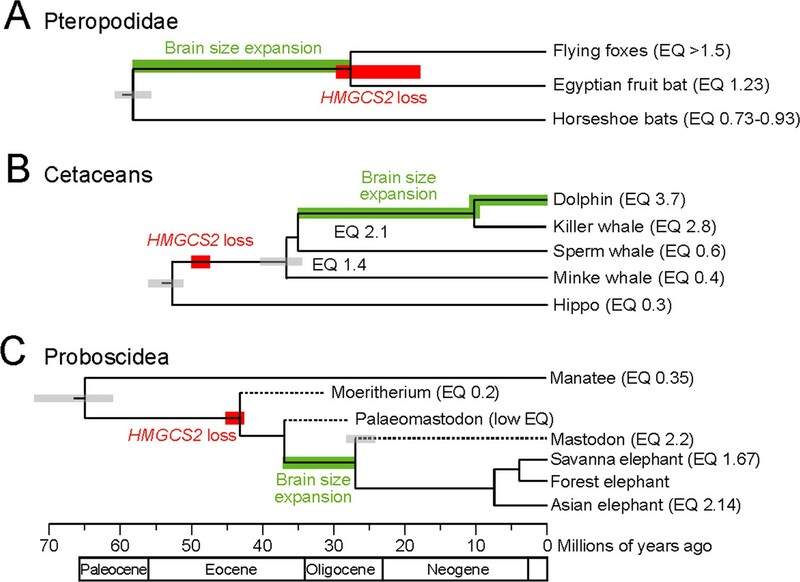 Furthermore, we show that in the cetacean and Elephantimorpha clades HMGCS2 was lost before brain size expansion happened, suggesting that the lack of ketogenesis did not prohibit the evolution of large brains in these lineages. While strong conservation of HMGCS2 in other mammals indicates that ketogenesis is a crucial metabolic process, the recurrent loss of this gene highlights an unexpected flexibility in mammalian energy metabolism. To investigate the evolution of HMGCS2, we used a previously published whole genome alignment to inspect the gene sequence and the surrounding locus across 70 placental mammals (Sharma and Hiller, 2017). Surprisingly, we discovered that three independent lineages (cetaceans, pteropodids and the African savanna elephant) exhibit large deletions that remove HMGCS2 exons or gene-inactivating mutations that shift the HMGCS2 reading frame and destroy conserved splice site dinucleotides (Figure 1B). All three lineages have a deletion of exon one that encodes the mitochondrial targeting domain; such a deletion causes HMG-CoA synthase-2 deficiency in human individuals (Pitt et al., 2015). Other mutations affect exons encoding key residues required for HMG-CoA synthase catalytic activity and leave little of the coding sequence intact. Together with the deletion of the promoter region in pteropodids, the elephant and the sperm whale (Figure 1—figure supplement 1), this shows that three mammalian lineages lost the enzyme that is required for ketogenesis. 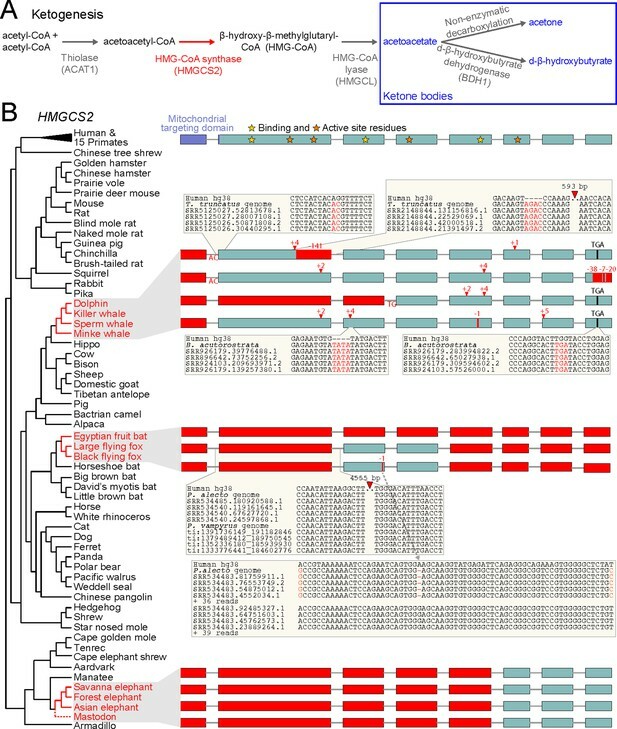 In cetaceans and pteropodids, the remnants of the once-functional HMGCS2 gene are located in a conserved genomic context with REG4 upstream and PHGDH downstream. In elephant, the three remaining HMGCS2 exons also occur in the same genomic locus adjacent to the conserved PHGDH gene, but inversions that already happened in the ancestor of elephants and the closely related manatees rearranged the locus upstream of HMGCS2 (Figure 1—figure supplement 2). These rearrangements were succeeded by a large deletion in the elephant lineage that removed the first five HMGCS2 exons together with the REG4 gene. To rule out that the gene-inactivating mutations are sequencing or genome assembly errors, we validated all smaller mutations and exon deletions with unassembled sequencing reads from the SRA and TRACE archives using blastn. All 22 mutations in cetaceans were confirmed by at least 30 reads, with no support for the non-gene-inactivating allele (Figure 1B, Supplementary file 1). This includes the deletion of exon one that exhibits shared breakpoints in the toothed and baleen whale lineages (Figure 1—figure supplement 3), which strongly suggests that this deletion and thus HMGCS2 loss already occurred before the split of the main cetacean lineages (Figure 1C). This is further supported by the 2 bp frameshifting insertion in exon two that is shared between killer whale and minke whale, and was later deleted in dolphin and sperm whale. In pteropodid bats, the ~4.5 kb deletion that removed coding exon two is validated by sequencing reads and is shared between both flying foxes (Figure 1B), suggesting that HMGCS2 was already lost in their common ancestor. Using the HMGCS2 sequence of the David’s myotis bat, we detected no evidence for the presence of the deleted HMGCS2 exons in unassembled sequencing reads of both flying fox species, while we readily found all exons of the HMGCS1 paralog, showing that the search is sufficiently sensitive. In the Egyptian fruit bat, HMGCS2 is entirely removed by a large deletion between the REG4 and PHGDH genes, which we validated with an independent PacBio assembly (Figure 1—figure supplement 4). Consistent with ongoing gene erosion, the 1 bp deletion in exon three is heterozygous in the black flying fox (Figure 1B). To rule out that the partial gene deletion in the African savanna elephant is an assembly error, we used the manatee HMGCS2 sequence. Sensitive blastn searches found no significant hits for the deleted HMGCS2 exons or the deleted neighboring REG4 gene in the unassembled sequencing reads of two different savanna elephant individuals (Cortez et al., 2014). In contrast, the three remaining HMGCS2 exons as well as all exons of the paralogous HMGCS1 could be recovered. We also investigated related elephant species, making use of recently published sequence data from the African forest elephant and the Asian elephant (Palkopoulou et al., 2018; Reddy et al., 2015). Further, we queried sequence data from two American mastodons, extinct Elephantimorpha that split from elephants 28–24 Mya (Rohland et al., 2007). As for the savanna elephant, the three remaining HMGCS2 exons and entire HMGCS1 gene were found in all three species, while the deleted HMGCS2 exons and the REG4 gene were not found (Figure 1B). Parsimony suggests that the deletion, which removed large parts of HMGCS2, occurred prior to the divergence of mastodons and the elephant species. We further found that the remaining HMGCS2 sequence evolves under relaxed selection in cetaceans, pteropodids and Elephantimorpha (p<3e-3, Supplementary file 2). Together with the conserved genomic context, the lack of any evidence of a remaining functional HMGCS2 in unassembled reads and the validated gene-inactivating mutations, we conclude that the main ketogenesis enzyme is lost in three independent mammalian lineages. Finally, we considered the possibility that HMGCS1, the cytosolic HMG-CoA synthase, may compensate for HMGCS2 loss, which would require HMGCS1 to be localized in the mitochondria, where ketogenesis happens in other species. We found that the HMGCS1 protein of cetaceans, pteropodids and elephant does not possess a mitochondrial targeting domain. Furthermore, an analysis of available liver RNA-seq data from the minke whale and Egyptian fruit bat provides no indication of alternative or novel exons in HMGCS1 that could encode such a targeting signal. Thus, HMGCS1 does not seem to be capable of compensating for the loss of HMGCS2, suggesting that ketogenesis is lost in cetaceans, pteropodids and Elephantimorpha. Next, we investigated whether the loss of HMGCS2 is associated with the loss of other enzymes in the ketogenesis pathway (Figure 1A). ACAT1 and HMGCL do not exhibit inactivating mutations in cetaceans, pteropodids and the elephant, likely because the respective enzymes are not only required for the production of ketone bodies but are also involved in leucine and isoleucine metabolism. In contrast to these two pleiotropic genes, BDH1 is only involved in converting acetoacetate into the ketone body d-β-hydroxybutyrate (Figure 1A). We found that BDH1 exhibits several inactivating mutations and evolved under relaxed selection in cetaceans and pteropodids (Figure 1—figure supplement 5, Supplementary file 2). Overall, this suggests that the loss of HMGCS2 is only associated with the loss of non-pleiotropic genes in the ketogenesis pathway. The 59 other mammals, for which the genome assembly fully covered the HMGCS2 locus (Figure 1B), do not exhibit inactivating mutations in this gene. Consistent with the presence of a functional gene, we further estimated an average non-synonymous/synonymous (dN/dS) ratio of 0.16, which indicates that HMGCS2 evolves under strong purifying selection in other mammals. The observation that HMGCS2 is well-conserved in the majority of mammals is consistent with ketogenesis being an important metabolic process. However, the recurrent loss of HMGCS2 raises the question of which energy source is used by the brain during fasting. Consistent with the loss of ketogenesis in cetaceans, bottlenose dolphins do not produce ketone bodies after fasting for 3 days but are nevertheless able to maintain high blood glucose levels over this entire period (Ridgway, 2013). It was suggested that dolphins maintain high glucose levels by synthesis of glucose from non-carbohydrates (gluconeogenesis), in particular from glucogenic amino acids that are abundant in their diet (Ridgway, 2013). This suggests that ketogenesis became dispensable in dolphins and that HMGCS2 was lost as a consequence of relaxed or no selection to maintain this gene. Similarly, the loss of ketogenesis in pteropodid fruit bats may be a consequence of the relatively constant availability of fruit year-round, which provides large quantities of glucose. This is in agreement with molecular dating, which estimates that the loss of HMGCS2 happened rather late in the lineage leading to the fruit bat clade and may even have occurred independently after the split of the frugivorous flying foxes and the Egyptian fruit bat (Figure 2A). Consistent with lack of ketone bodies as alternative fuel, Egyptian fruit bats that were fasted for more than 24 hours in captivity frequently died (van der Westhuyzen, 1978). Thus, like HMG-CoA synthase-2 deficient human individuals, these bats are sensitive to starvation. Hence, while ketogenesis may have been lost under ancestral conditions of constantly available, glucose-rich food, the loss of HMGCS2 may now represent a disadvantage, which will be of interest to ongoing conservation efforts for ecologically and economically important species in the pteropodid family. In contrast to cetaceans and fruit bats, little is known about how elephants respond to fasting; however, the following observation is consistent with the loss of ketogenesis. During musth, when elephant males experience longer periods of fasting and can lose 10% of their body weight, their blood becomes slightly more alkaline (Rasmussen and Perrin, 1999). This is contrary to an increased blood acidity that would be expected from an increasing production of acidic ketone bodies. HMGCS2 loss and brain size evolution. (A) In pteropodids, molecular dating estimates that the loss of HMGCS2 happened 29–18 Mya and thus may overlap the split of the flying foxes and the Egyptian fruit bat. It is not possible to resolve whether gene loss happened before or after the split as HMGCS2 is completely deleted in the Egyptian fruit bat. 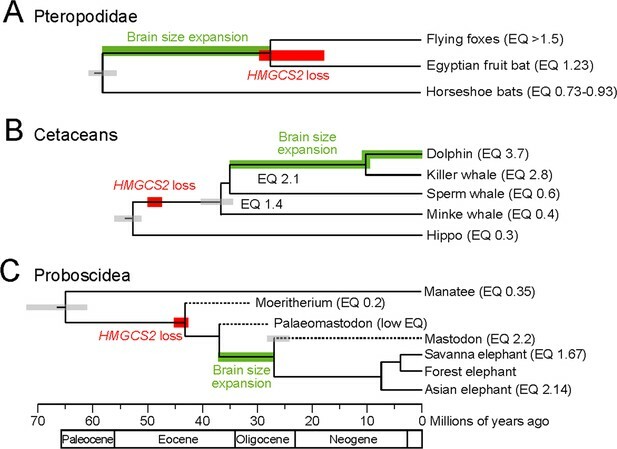 While horseshoe bats and other insectivorous bat lineages have brains not larger than expected for their body size (encephalization quotient (EQ) <1), brain size has increased in the lineage leading to the fruit bats that have EQ values > 1 (Stephan et al., 1981). Thus, brain size expansion presumably predates the loss of ketogenesis. (B) HMGCS2 was already lost in the cetacean ancestor before the split of toothed and baleen whales ~ 36 Mya, as inferred from shared inactivating mutations in exons 1, 2 and 8. Molecular dating further estimates that the loss of this gene happened early on the cetacean branch 50–47 Mya. The cetacean ancestor had a brain slightly larger than expected for its body size with an EQ of 1.4. While EQ values increased and decreased in several cetacean lineages, brain size has greatly expanded in dolphins, reaching an EQ of 3.7 (Montgomery et al., 2013). Thus, brain size expansion in dolphins occurred after the loss of ketogenesis. (C) Early proboscids such as Moeritherium, an extinct lineage that split from other proboscids ~ 43 Mya, had brains about 20% of the size expected for a mammal of the same body size, and thus an EQ of 0.2 (Shoshani et al., 2006). Exact EQ values of Palaeomastodons are not known; however, fossils have a small braincase, which indicates a low EQ (Sanders et al., 2010; Benoit, 2015). In contrast, mastodons that diverged from elephants ~ 27 Mya had brains about twice as large as expected from their body size (EQ 2.2), similar to extant elephants (Shoshani et al., 2006). This suggests that brain size expansion happened in a period between 37 and 27 Mya. Molecular dating indicates that HMGCS2 loss happened between 45 and 42 Mya, suggesting that the loss of ketogenesis precedes brain size expansion in the elephant lineage. Divergence times of extinct proboscid lineages were taken from (Shoshani and Tassy, 2013) and (Rohland et al., 2007). Supporting Information. Given the importance of ketogenesis to provide energy to the brain during starvation, it is noteworthy that species in all three HMGCS2-loss lineages generally have large relative brain sizes (Stephan et al., 1981; Boddy et al., 2012). For example, the encephalization quotient (EQ), measuring the ratio between the observed brain size and the size expected for a mammal of the same body weight, is 3.7 for the bottlenose dolphin (Montgomery et al., 2013). Compared to human, dolphins and elephants are also among the few mammals that have a higher degree of neocortex folding, a measure that positively correlates with neuron number (Manger et al., 2012; Lewitus et al., 2014). Furthermore, while powered flight imposes a constraint on body and brain size in bats, pteropodid fruit bats exhibit a well-developed visual brain system and have brains nearly twice as large as that of insectivorous vesper bats of equal body weight (Stephan et al., 1981). Species in all three lineages also exhibit cognitive behaviors that are regarded as a sign of intelligence, exemplified by vocal learning and, in dolphins and elephants, by complex social structures, tool use and self-recognition (Krützen et al., 2005; Foerder et al., 2011; Poole et al., 2005; Prat et al., 2015; Plotnik et al., 2006). Thus, the loss of HMGCS2 in independent large-brained species suggests that ketone bodies are not strictly required to fuel large mammalian brains during fasting. Finally, the timing of HMGCS2 loss has implications for understanding the general preconditions for brain size expansion during the evolution of mammals. While the loss of HMGCS2 in pteropodids likely happened after brain size expansion in this lineage (Figure 2A), shared inactivating mutations show that HMGCS2 was already inactivated in the cetacean ancestor, and thus prior to a period of brain size expansion that resulted in the large brains of dolphins (Boddy et al., 2012; Montgomery et al., 2013) (Figure 2B). For the elephant lineage, we used molecular dating to estimate that HMGCS2 was lost around 45–42 Mya (Supplementary file 3). Thus, like in toothed whales, the loss of this gene likely occurred prior to the period that led to large relative brain sizes in modern elephants (Shoshani et al., 2006) (Figure 2C). Consequently, while ketogenesis was likely a crucial factor for brain size increase in humans (Cunnane and Crawford, 2003; Wang et al., 2014), the loss of ketogenesis has not prohibited drastic evolutionary brain size expansion in two other mammalian lineages. In conclusion, we have identified three independent losses of HMGCS2 in placental mammals. While this may contribute to starvation sensitivity in fruit bats, cetaceans and elephants can withstand periods of fasting. Hence, alternative strategies to fuel large brains during fasting have evolved at least twice, revealing flexibility in the energy metabolism of mammals. Finally, the timing of HMGCS2 loss indicates that ketogenesis is not a universal precondition for the evolution of large mammalian brains. More generally, our results further highlight the potential of comparative gene analyses (Emerling and Springer, 2014; Meredith et al., 2009; Castro et al., 2014; Albalat and Cañestro, 2016; Lopes-Marques et al., 2017; Hecker et al., 2017; Gaudry et al., 2017; Sharma et al., 2018a; Sharma et al., 2018b; Meyer et al., 2018; Emerling et al., 2018) to reveal novel insights into the evolution of metabolic, physiological or morphological phenotypes. To investigate the HMGCS2 sequence across mammals, we used a whole genome alignment between the human reference genome (hg38 assembly) and 69 other placental mammal genomes (Sharma and Hiller, 2017). In addition to these assemblies, we downloaded the genome assembly of the Hippopotamus (Árnason et al., 2018) (NCBI GCA_002995585.1) and updated genome assemblies of the Large flying fox (NCBI GCF_000151845.1), the Egyptian fruit bat (NCBI GCF_001466805.2) and the African savanna elephant (ftp://ftp.broadinstitute.org/distribution/assemblies/mammals/elephant/loxAfr4/). For these four assemblies, we computed pairwise alignment chains to the human hg38 genome by applying lastz (Harris, 2007) with parameters K = 2400, L = 3000 and the default scoring matrix, axtChain (Kent et al., 2003) and chainCleaner (Suarez et al., 2017) (both with default parameters). Collinear alignment chains were visualized in the UCSC genome browser (Casper et al., 2018) and inspected for conserved synteny with adjacent genes. All analyzed genome assemblies are listed in Supplementary file 4. We used the gene loss detection approach (Sharma et al., 2018a) to search across all mammals for mutations that could inactivate HMGCS2. This approach considers large deletions that cover exons, frameshifting insertions and deletions, mutations that disrupt donor (GT/GC) or acceptor (AG) splice site dinucleotides, and nonsense mutations. To exclude false inactivating mutations caused by alignment ambiguities, this method only considers those putative inactivating mutations that were confirmed by CESAR (Sharma et al., 2016; Sharma et al., 2017), a method trained to output an intact exon alignment whenever possible. Furthermore, exon deletions or exonic regions that do not align between human and another species were only considered if the respective locus did not overlap an assembly gap in the other genome (Hiller et al., 2012). For the proboscis monkey and lesser Egyptian jerboa, greater than 20% of the HMGCS2 protein-coding region was ambiguous bases due to assembly gaps. These species were classified as ‘missing’, as it is not possible to unambiguously determine presence or absence of HMGCS2. Exon losses and inactivating mutations identified were manually validated using unassembled sequencing read data from the TRACE and Sequence Read Archives. To validate exon losses, we used sensitive blastn runs (word size = 7) to search read data of HMGCS2 loss species. As queries, we used HMGSC1 and HMGCS2 exon sequences from a closely related species with an intact HMGCS2 gene. Specifically, we used the cow sequence to search cetacean read data, and the sequence of David’s myotis bat to search pteropodid read data. Read data from elephants and mastodon was searched using the manatee HMGSC1, HMGCS2 and REG4 exonic sequence. To validate smaller inactivating mutations (stop codon, frameshift and splice site mutations) and exon deletions, we extracted the genomic context 50 bp up- and downstream of each inactivating mutation in an HMGCS2 loss species and determined the number of sequencing reads that support the derived (inactivating) and ancestral (non-inactivating) allele, as described in (Hecker et al., 2017). SRA accessions are provided in Supplementary file 5. We generated a multiple sequence alignment of the HMGCS2 coding sequence from the CESAR alignments and replaced in-frame stop codons with ‘NNN’. Using MACSE v2 (Ranwez et al., 2018), we added to this alignment the Chinese Horseshoe bat (Rhinolophus sinicus, XM_019730577) and the Hippopotamus amphibius HMGCS2 coding sequence as well as the inferred exonic sequences of the Asian elephant, the African forest elephant and the mastodon. The alignment was then refined using MACSE v2 prior to visual inspection and further refinement. RELAX (Wertheim et al., 2015) was applied to test for relaxation of selection. First, we designated all branches within the cetacean, pteropodid and elephant/mastodon subtrees as foreground and designated all other branches as background. Second, we tested each subtree separately against the background branches, removing the other two HMGCS2 loss lineages. We also tested the elephant lineage including only the African savanna elephant. To date the loss of HMGCS2 along the putative loss branches in the phylogenetic tree, we used the method described in (Meredith et al., 2009; Gaudry et al., 2017), which estimates the portion of the loss branch where the gene evolved under selection and the portion where it evolved neutrally. Since synonymous positions do not entirely evolve neutrally due to constraints on splicing and translation, this approach assumes that the synonymous mutation rate of a functional gene is 70% of the fully-neutral synonymous mutation rate of an inactivated gene. Upper and lower bounds of species divergence times, the estimated length of the loss branch and respective sources are given in Supplementary file 3. The branch model in PAML (Yang, 2007) was fit, with five dN/dS classes, one for each of the three loss branches, one for the subsequent pseudogene branches and a final class for all functional branches. Pseudogene branches were assumed to evolve with a dN/dS of 1 for the dating calculations. We also fit models for each loss lineage individually and further tested the elephant lineage including only the African savanna elephant. We tested the amino acid sequences of the annotated or CESAR-inferred HMGCS1 protein from all HMGCS2-loss species for the presence of a potential mitochondrial target peptide (mTP) using TargetP (Emanuelsson et al., 2007). This revealed no evidence for the presence of an mTP in any species. To investigate the possibility that an mTP is provided by a novel or alternative first coding exon, we inspected gene predictions from Augustus that were available for all species. Those predicted gene models that contained an alternative first exon were found to not have an mTP. Furthermore, we used RNA-seq data from liver, the primary site of ketogenesis in other species, which was available for the Egyptian fruit bat (SRA SRR2914059, SRR2914369) and the minke whale (SRR919296). RNA-seq reads were mapped to the genome using HISAT2 (Kim et al., 2015), SAM files were sorted and converted to BAM files using SAMtools (Li et al., 2009) prior to visualization in the UCSC genome browser. For both species, we found no evidence of alternative or novel exons that could result in a different HMGCS1 N-terminus. Three other genes, ACAT1, HMGCL and BDH1, which encode components of the ketogenesis pathway were investigated for potential inactivating mutations using the same gene loss pipeline and mutation validation strategy described above. These genes were also tested for signs of relaxed selection in the three HMGCS2-loss lineages using RELAX (Supplementary file 2). All data analyzed during this study is publicly available on NCBI, SRA and the Trace Archive. The multiple sequence alignment of the mammalian HMGCS2 coding sequences is provided as Figure 2—source data 1. Journal of Vertebrate Paleontology 35:e991021. Journal of Evolutionary Biology 25:981–994. Annual Review of Nutrition 26:1–22. American Journal of Physiology-Regulatory, Integrative and Comparative Physiology 259:R1086–R1089. Proceedings. Biological Sciences, 281, 10.1098/rspb.2013.2669, 24307675. Journal of Clinical Investigation 124:5175–5190. Comparative Biochemistry and Physiology Part A: Molecular & Integrative Physiology 136:17–26. Journal of Cerebral Blood Flow & Metabolism 14:125–131. Genome Biology and Evolution 9:3179–3188. American Journal of Physiology-Regulatory, Integrative and Comparative Physiology 249:R462–R470. Molecular Phylogenetics and Evolution 116:78–86. The Journal of Comparative Neurology 520:2430–2439. Journal of Inborn Errors of Metabolism and Screening 5:215. Journal of Clinical Investigation 46:1589–1595. Journal of Inherited Metabolic Disease 38:459–466. European Journal of Medical Genetics 56:411–415. Molecular Biology and Evolution, 10.1093/molbev/msy159, 30165589. Proboscidea, Cenozoic Mammals of Africa, University Of California Press. 173, Order Proboscidea Elephants, Mammals of Africa, 1, London. Comparative Biochemistry and Physiology Part A: Physiology 59:335–338. Journal of Zoological Systematics and Evolutionary Research 19:195–222. New England Journal of Medicine 337:1203–1207. Journal of Medical Science 74:99–101. Molecular Biology and Evolution 32:820–832. European Journal of Pediatrics 162:279–280. Thank you for submitting your article "Recurrent loss of HMGCS2 shows that ketogenesis is not essential for the evolution of large mammalian brains" for consideration by eLife. Your article has been reviewed by three peer reviewers, including Vincent J Lynch as a guest Reviewing Editor and Reviewer #1, and the evaluation has been overseen by Wittkopp as the Senior Editor. The following individuals involved in review of your submission have agreed to reveal their identity: Cristian Cañestro (Reviewer #2); Kevin Campbell (Reviewer #3). In this manuscript Jebb and Hiller report the loss of the HMGCS2 gene in three mammalian lineages, which is very surprising given the role HMGCS2 plays in acetoacetate synthesis. This is surprising because fatty acid-derived ketone bodies provide energy for the brain during neonatal development and fasting suggesting there is strong selection to maintain this gene and pathway. These data suggest that cetaceans, Old World fruit bats, and Proboscideans either evolved alternative metabolic strategies to deal with HMGCS2 loss or some other functionally similar gene performs a similar role as HMGCS2. 1) If ketones are no longer used for ATP production do other genes in the pathway show evidence of reduced purifying selection or loss? 2) Given the ability to estimate a relative date of loss of elephants why not bats and cetaceans? 3) Please confirm HMGCS2 loss using the more recent loxAfr4 assembly; It's likely missing in loxAfr4 as well but best to confirm. 4) The fact that HMGCS1 is localized in the cytosol, and not in mitochondria, implies that HMGCS1 cannot rescue the lack of HMCGS2 (if so, please mention in the manuscript, and provide references supporting this fact). Along these lines, is it possible to show that HMGCS1 does not have a putative gain of a "novel alternative exon1" in HMGCS1 coding for a mitochondrial targeting domain could allow to make this paralog to be functionally redundant with HMGCS2 (and making it therefore dispensable)? While the reviewers understand that this scenario may be remote, in such case those species could continue producing ketone bodies, which therefore would significantly affect the main conclusions of the manuscript. Is there EST (transcriptomic) data for any of the species that has lost HMCGS2 to discard (or at least check) that possibility? Gene prediction software could also be helpful to check for the presence of such potential mitochondria-target exon in HMGCS1 (which in principle should be shared within each group of mammals that share the loss to corroborate its presence). Thank you for raising this question. The first and third steps in the ketogenesis pathway are catalyzed by ACAT1 and HMGCL, respectively. We found that these genes do not have any inactivating mutations in the lineages that lost HMGCS2. This is probably explained by the fact that both enzymes are also required for amino acid metabolism. BDH1 is a non-pleiotropic enzyme that converts the ketone body acetoacetate into the ketone body d-β-hydroxybutyrate. We found that this gene is lost in cetaceans and pteropodids, where several inactivating mutations are present together with a signature of relaxed selection. No evidence for loss or relaxed selection was found in the elephant. Analyzing this gene in other mammals, we found that the shrew probably also lacks this enzyme, while ACAT1, HMGCS2 and HMGCL are fully intact in this species. Similar to Bdh1 knockout mice, acetoacetate and acetone are likely the main ketone bodies in the shrew. “With the exception of the mitochondrial HMG-CoA synthase (HMGCS2, red font), the other two enzymes required for acetoacetate production also have roles in amino acid metabolism and are thus pleiotropic. BDH1 is only required for converting acetoacetate into d-β-hydroxybutyrate. As suggested, we have now performed molecular dating for the fruit bat and cetacean lineage. To get estimates as precise as possible, we first investigated HMGCS2 in species that represent their closest outgroups, using new genomes that recently became available. For the fruit bats, we inspected the genome of the horseshoe bat (the closest insectivorous outgroup) and found that this bat has an intact, annotated gene. For cetaceans, we aligned the hippo genome, which also revealed an intact gene. Both species have been added to the phylogenetic tree in Figure 1B. To estimate a Ka/Ks value for the internal branches along which the gene was lost, we used PAML. For the fruit bats, we estimate that HMGCS2 loss occurred rather late on the branch and overlaps the split of the flying foxes and the Egyptian fruit bat (note that it cannot be resolved whether the gene was lost before or after the split since the gene is entirely deleted in the latter species). For cetaceans, we estimate a loss relatively soon after the split from the hippo lineage. To present these results, we decided to split the previous Figure 1 and show the molecular dating results for all three lineages in a new Figure 2A-C. Since our full alignment now contains two additional species, we re-estimated the date of HMGCS2 loss in the elephant lineage with PAML. Furthermore, we now included not only the African savanna elephant sequence in the alignment but also the sequences from the forest elephant, Asian elephant and mastodon that we obtained by aligning genomic read data. While this makes the assumption that the other Elephantimorpha species share the same deletion of HMGCS2 exons 1-5, we believe adding additional species will increase the precision of the estimate. As shown in Supplementary file 3, with additional Elephantimorpha, we obtained a younger, probably more precise loss estimate of 45 to 42 Mya, which overlaps the split of the low-EQ Moeritherium. Importantly, the Palaeomastodon, a more recent lineage that split ~37 Mya from other proboscids (added to Figure 2C), is also described to have had a small braincase and thus probably had a low EQ, which suggests that loss of ketogenesis still predates the period of brain size expansion in Proboscidea. We investigated the HMGCS1 protein sequences in each loss species with TargetP, which reveals no evidence for the presence of a mitochondrial targeting domain. In order to identify novel or alternative first exons that could provide a new N-terminus, we first inspected available Augustus gene predictions for putative alternative HMGCS1 transcripts and again found no mitochondrial targeting domain. Second, for the Egyptian fruit bat and the minke whale, RNA-seq data from the liver (the site of ketogenesis in other species) is available. By processing and analyzing this data, we found no evidence for alternative or novel first exons in the Egyptian fruit bat. For the minke whale, RNA-seq data showed an upstream first exon; however, this exon did not contain an ATG start codon, showing that this exon is part of the UTR and that the minke whale HMGCS1 does not encode a different N-terminus. We thank Martin Pippel, Gene Myers, Sonja Vernes and Emma Teeling for access to PacBio reads of Rousettus aegyptiacus. We also thank Nikolai Hecker for computing genome alignments and source code for read validation, Sider Penkov for helpful discussions, Juliana Roscito for comments on the manuscript and the Computer Service Facilities of the MPI-CBG and MPI-PKS for their support. This work was supported by the Max Planck Society and the German Research Foundation (HI 1423/3–1). © 2018, Jebb et al.